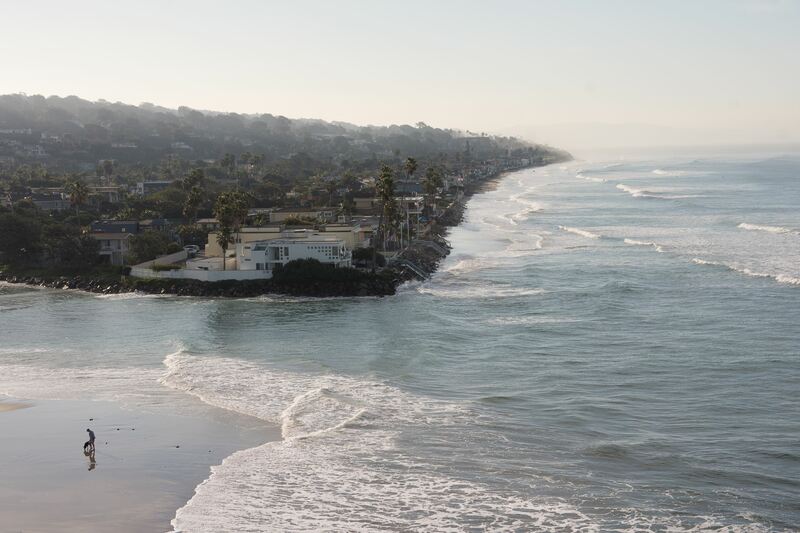 The City of Del Mar has demonstrated great leadership and commitment to actively plan for sea-level rise to protect local beaches, coastal bluffs, and environmental resources and minimize impacts to residents, businesses, and visitors. After years of public outreach, discussion, and over 25 public meetings, in October 2018 the City Council adopted the package of Local Coastal Program Amendments and technical documents relating to Del Mar's Coastal Resiliency/Sea Level Rise Planning Work Program. In addition to meeting various state and federal obligations, this scientifically grounded planning process helped the City to reduce risk and plan ahead to protect the future of Del Mar. An ad-hoc advisory committee was utilized to provide a public forum for stakeholder review, discussion, and recommendations to the City Council while the Sea Level Rise Stakeholder Technical Advisory Committee was active between July 2015 and September 2018. This helped the City tailor the plans accordingly to account for community values and concerns. The City's adopted plans for adaptation and resiliency identify the City's priorities for adaptation through beach nourishment/management, river channel dredging, and flood management; and continued implementation of the City's Beach Preservation Initiative and Del Mar Municipal Code Chapter 30.50. The City concluded that planned retreat (managed retreat) is not necessary or feasible in Del Mar. Therefore, planned retreat is not a proposed strategy; and will only be re-evaluated with future planning and plan amendment if it becomes necessary and feasible. Generous grants from the California Ocean Protection Council, California Coastal Conservancy and California Coastal Commission, together with supplemental funding from the City of Del Mar, have made this work program possible. Accepted the supporting technical documents: Vulnerability Assessment, Sediment Management Plan, and Lagoon Wetland Habitat Migration Assessment. Directed staff to return to City Council with a Resolution to reiterate the City Council's commitment to continue to reject managed retreat during the Coastal Commission LCPA certification process. Adopted the Land Use Plan Amendment portion of LCPA 18-002 by Resolution. Continued the public hearing for the Ordinance (ZA 16-008)/ LCPA 18-002) with direction to proceed with the code amendments, but with no rezone or expansion of the existing overlay zone boundaries. View the October 1, 2018 Report to the City Council (PDF) and the Coastal Commission comment letter (PDF). Adopted the Commitment Resolution (PDF) to reiterate the Council's commitment to reject managed retreat during the Coastal Commission certification process. Confirmed the LCP Land Use Plan Resolution accurately reflects the prior Council action. Introduced the Ordinance to amend DMMC Chapter 30.29 (Floodway Zone), Chapter 30.55 (Coastal Bluff Overlay Zone), and Chapter 30.56 (Floodplain Overlay Zone) with no change to the overlay zone boundaries. View the October 15, 2018 Report to City Council (PDF). On October 29, 2018, the City Council adopted the Ordinance amending the Floodway Zone, Coastal Bluff Overlay Zone, and Floodplain Overlay Zone regulations as introduced. This action allowed the City to submit the LCPA package to the Coastal Commission in time for the October 31, 2018 grant deadline; and to submit the Ordinance to the Federal Emergency Management Agency to bring the City into compliance with FEMA’s floodplain management requirements. Coastal Commission staff is reviewing the City’s submitted LCPA and indicated their goal is to set the item for the June 2019 Coastal Commission meeting in San Diego. The Del Mar Adaptation Plan is a "toolbox" to help property owners (public and private) plan for and address future sea-level rise, storm surge, coastal flooding, and erosion. On October 1, 2018, the City Council adopted the Adaptation Plan as a Local Coastal Program Amendment and accepted the supporting technical documents. Visit the City's Agenda Center to view staff reports, correspondence, minutes, and meeting videos. The next step is for the City to begin implementing its preferred adaptation strategies as part of a Shoreline Management Program. This initially will include work to implement the existing City Council priority to create a Sand Compatibility Opportunistic Use Program (SCOUP) to enable the City to more readily accept beach quality sand when available to nourish Del Mar’s beach. Information requests, notification list registration, and general inquiries should be sent to the Sea Level Rise email.